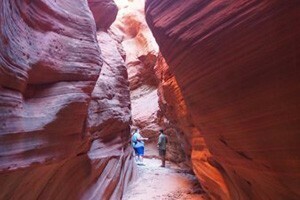 Both routes follow very narrow and scenic slot canyons to the Virgin River. The canyons are 12 to 24 hours of effort, generally done in two days. Hikers should be ready for 30-40 rappels, with some dropping over 200 feet. Hypothermia is always a risk, with cold potholes following one after another. In Imlay and Heaps Canyon, Zion's most beautiful and challenging terrain is waiting for the avid canyoneer. 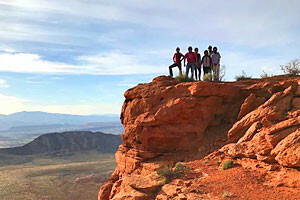 Both routes are high on the must-complete list as a significant goal for canyoneers. The long, narrow canyons wind through the sandstone rock, with pools, slick slopes, free rappels, undercut potholes and an unrelenting physical and mental challenge. It's an epic adventure, to say the least. Both Heaps and Imlay Canyon are rated at 4B R V during low water because of technical difficulty and risk. Even in the summer, hypothermia is a concern because the water will be at 50°F or less. Potholes pose a unique set of challenges to all visitors. In high water, the exit from a pothole may be as simple as hoisting yourself up. In low water, it may be necessary to hand drill and hook out. Needless to say, technical competence is highly valued in both these routes for safe completion. A backcountry permit is required for access into both Heaps and Imlay Canyons, so be sure to make a reservation online at http://zionpermits.nps.gov/ or call (435) 772-0170 for more information.